Our home has simple, pragmatic decorations for Christmas. 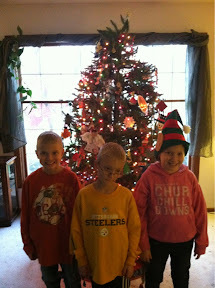 Hand-decorated ornaments adorn our tree by the dozens. 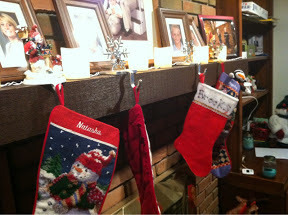 Stockings are hung by the chimney with care. I wish we could find Brooks' one that matches though. 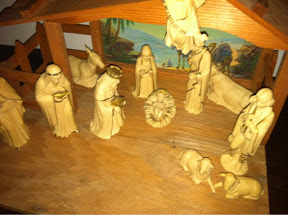 The nativity scene is the same one my parents put up their first Christmas together in 1965. Joseph's red lantern is long gone and one sheep is footless. Otherwise, it's in pretty good shape. Pragmatic. Nothing fancy. That's us.